These Air Fryer Zucchini Chips are the perfect snack, appetizer, and all around addictingly delicious way to enjoy more vegetables! 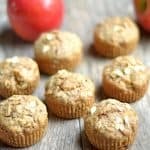 Grain-Free and Paleo, with a perfect and irresistible texture. 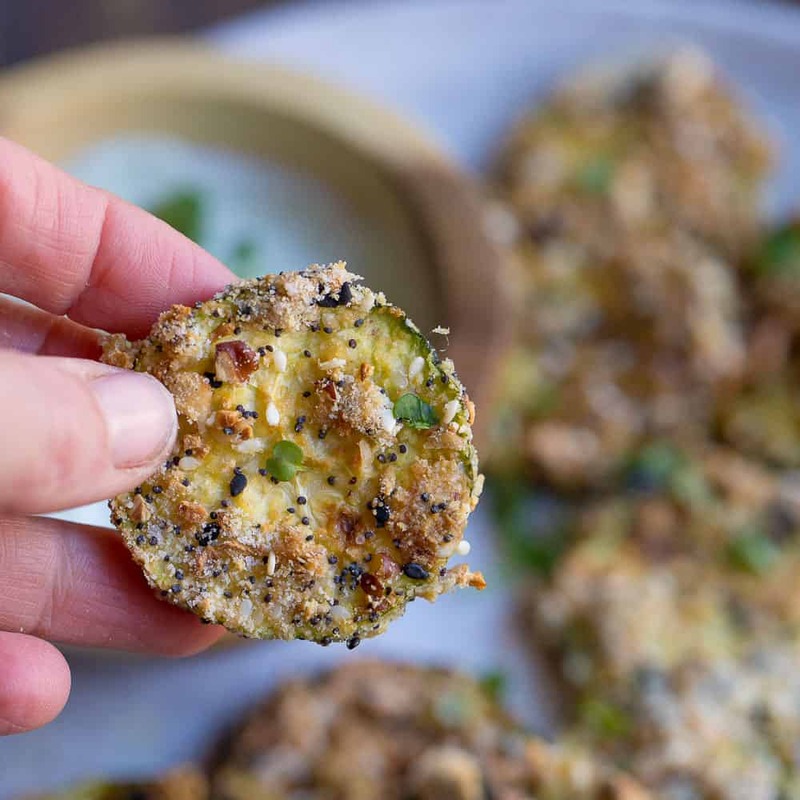 Kind of obsessed with my air fryer in general, but most definitely, in these zucchini chips. Some genius friend of mine on my Facebook feed was posting a picture the other day of her oven baked zucchini fries with a key ingredient: Everything But the Bagel Seasoning from Trader Joe’s. Have you guys had this stuff yet?!?! It’s just amazing. I always keep this product well stocked in my spice pantry for things like eggs and salad dressings. 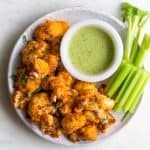 It hadn’t occurred to me yet, that this would make the most amazing, flavorful, and crispy topping on vegetables in my air-fryer. Thank you my dear Facebook friend!!! So these little perfect zucchini rounds did take some practice. I found they were better in the “chip” form as opposed to the “fry” form. I also needed a good blend of unsalted nuts (used pecans), and some almond flour for some more coating. 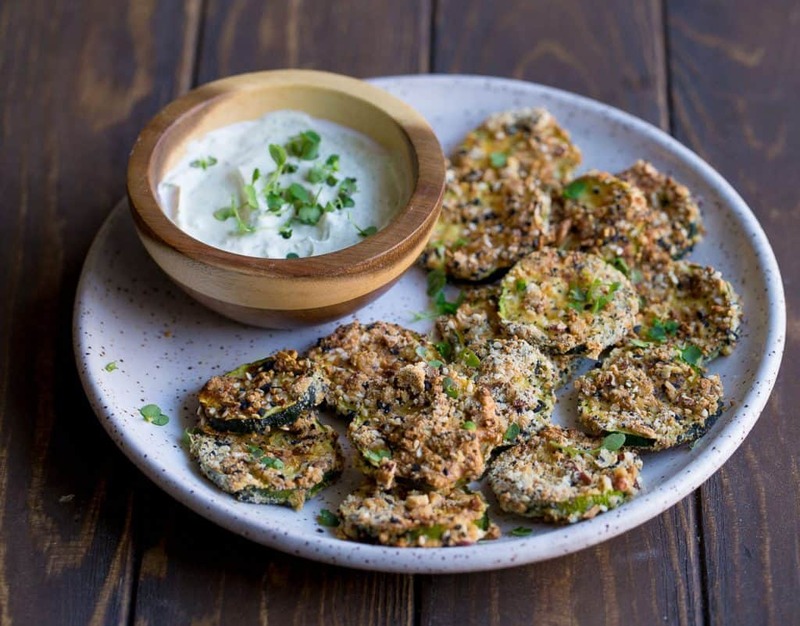 You see, the Everything But The Bagel Seasoning is down right delicious, but it’s also salty, so you can’t coat the entire zucchini chip in these. Another lesson, it’s probably worth it to double the batch. 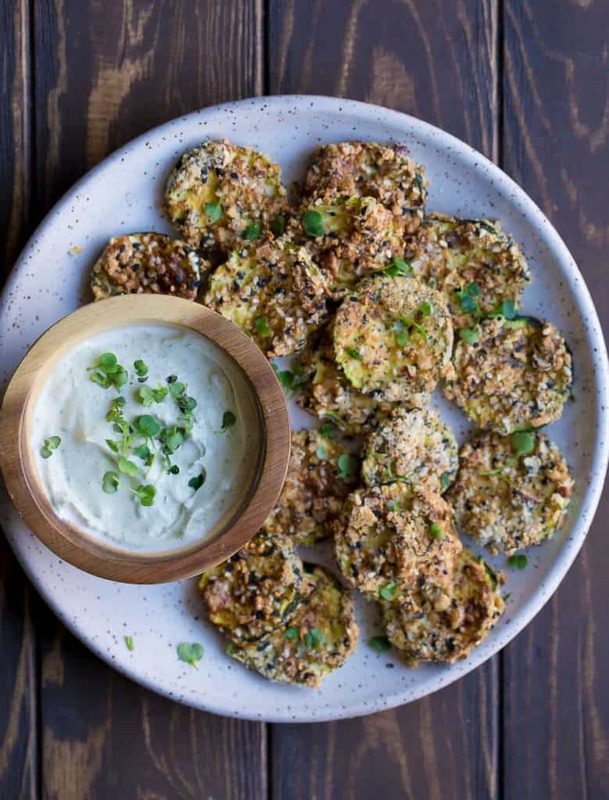 One regular sized zucchini will be enough to fill the air-fryer without overlapping (important), BUT, you will most likely want more than that. I decided to let my husband try, and he promptly stole the plate from me finishing every last morsel. Oh and the dipping sauce? You can use my homemade Creamy Avocado Cilantro Dressing or a homemade ranch dressing. Oh and P.S. Don’t have a Trader Joe’s nearby for that key ingredient? Here is a quick homemade version that works perfectly. Also, don’t have an Air Fryer yet? Here is the one I have and LOVE. 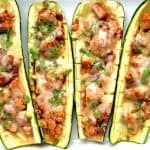 You can also make this on the stovetop by heating up 2 tbsp of oil to medium high in a large saute pan, and placing zucchini in the pan. Flip after 3-4 minutes per side (or whenever the zucchini is nice and golden). 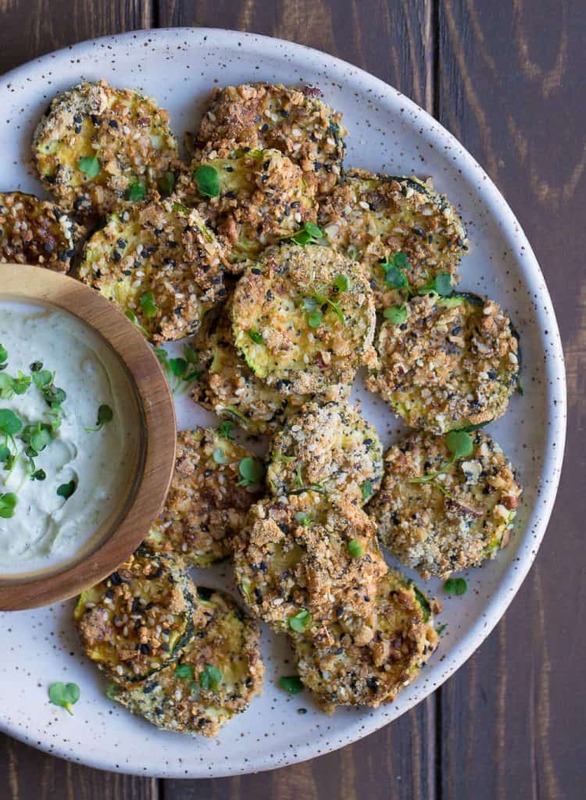 Preheat your air-fryer to 350 degrees while you prepare the zucchini. 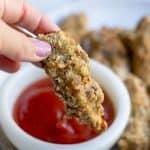 In a shallow bowl, combine almond flour, pecans, and seasoning. Whisk the egg in a separate bowl. Place them close to each other. Dip each zucchini slice into the egg mixture, then quickly into the flour/nut/seasoning mixture ensuring that each side is evenly coated. Place on a wired baking rack or parchment paper. Place as many zucchini slices you can at the bottom of the air fryer basket without overlapping them. *You can replace pecans with any other chopped nut: walnuts, almonds, etc.